TAR 37 is a rematch of TAR #1 with an all around format. 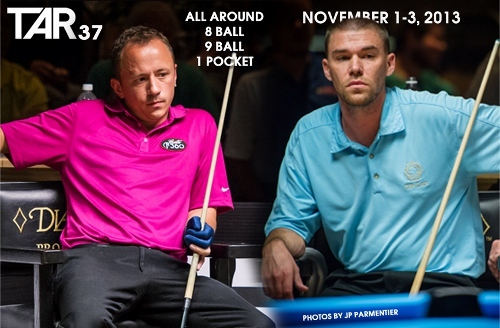 Corey Deuel will be taking on Shane Van Boening November 1-3, 2013 playing 8 Ball. 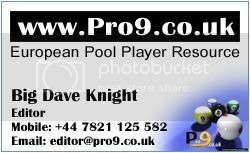 9 Ball, and 1 Pocket. Available live on streaming PPV. The prize fund is $5000. The winner of each day gets $1000 and the loser $500. Whoever wins the all around gets a $500 bonus. Jeremy Jones will be commentating on the One Pocket, and the action starts at 6PM Pacific each day - that's very late here, but don't worry, TAR run the stream in a continuous loop, so you can watch the stream any time, before the action resumes for the next day. Remember, this kicks off very late tonight, but with The Action Report, you can watch any time you like because they repeat the recording immediately and continuously until the next day's action begins, so many Europeans (including me) will be in the chat room and watching tomorrow morning.